KIEV, Ukraine -- Russian president Vladimir Putin has decreed that all Russian casualties “in peacetime” be a state secret. 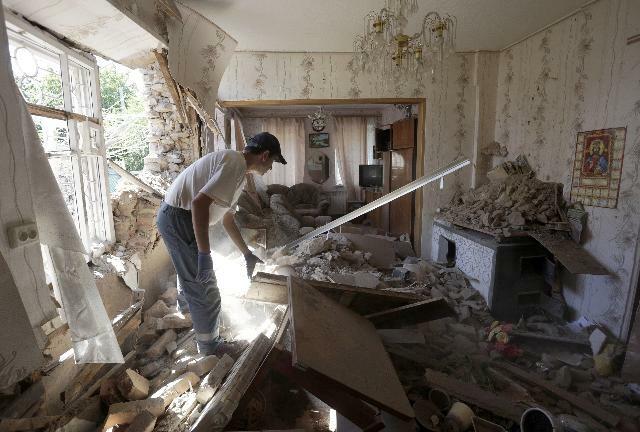 A local resident examines his building, destroyed during recent shelling, in the small town of Avdiivka, in the Donetsk region on August 25, 2015. Ukrainian President Petro Poroshenko accused Russia of this week sending three military convoys over the border into the separatist-controlled east with a total of up to 500 tanks, 400 artillery systems and up to 950 military armoured vehicles to pro-Russian rebels, although he did not specify the time period for these deliveries. In addition to criminal charges arising from divulging state secrets, families risk losing pensions and lump-sum payments if they reveal that their sons were killed in Ukraine. Mothers of soldiers’ associations have been branded “foreign agents” for collecting data on Russian casualties. Dissident Boris Nemtsov was murdered shortly before completing his study of Russian casualties in Ukraine. Russian civil rights organizations, working against the fog of official resistance, could confirm only several hundred battlefield deaths. Business Life (Delovaya Zhizn) reports on markets, finance, entrepreneurship, finance, and leisure, scarcely an outlet for sensational information. Russian censors quickly removed the offending material but not before it had been webcached by the Ukrainian journal Novy Region (New Region). In addition, the Russian government, in a decision about the monetary compensation of military personnel taking part in military action in eastern Ukraine, approved compensation for families of military personnel who were killed taking part in military action in Ukraine of three million rubles (about $50,000). For those who have become invalids during military action, the compensation is one and a half million rubles (about $25,000). A payment of 1,800 rubles ($26) is envisioned for contract “fighters” for every day of their presence in the conflict zone. Sovietologists found many secrets of the USSR by digging into the Soviet press and technical and financial trade journals. That fallen and invalided military personnel are compensated must be reflected somewhere in budgets. As reported in Delovaya zhizn, compensation payments for those killed and invalided in Ukraine came to almost $20 million dollars, not a large share of the approximately $50 billion defense budget but large enough to appear in an appropriate budget subcategory.